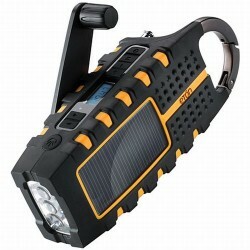 One of the biggest things to consider when investing in such a radio is its power source. If you live in an area that experiences severe weather, purchasing an emergency radio that will keep you abreast of weather conditions is a great idea. The following tips on how to choose an emergency radio will help ensure that you get the information you need when you need it. While these radios are small objects, they can give you life saving information as soon as it is available. One of the biggest things to consider when investing in such a radio is its power source. During many emergency weather events, power availability can be spotty at best. Some use back up rechargeable batteries that will get them through periods when your power goes out. Others rely solely on battery power. When choosing the ideal model for you and your family, make sure that its power capabilities fit in with your lifestyle and the likelihood that you will lose power in the case of an inclement natural event. Another thing to consider it your model of choice’s alert system. As these events can come at any time, day or night, it is important to select an option that will wake you if you are asleep, or be attention getting enough if you are otherwise engaged when an alert is available. Some emergency radios, like the CC Observer emergency radio, come with light up displays as well as more traditional alarm systems, making it easier to see and understand what it going on at any time. Remember, the more alert methods that they offer, they better off you will be if you need to get vital information quickly. For those who live in areas where the weather systems can quickly change, an emergency radio can be a lifesaving device. Such radios are available both in most electronic stores as well as through a number of different outlets online. In selecting the one that is right for you, make sure that you consider its power sources as well as the alert methods that it employs. PreviousKitchen Worktops – Do You Like Quartz?